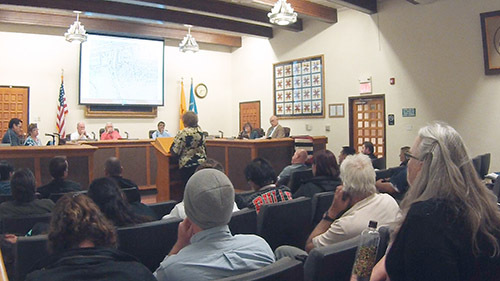 The Gallup City Council convened April 10 with a packed agenda, and began the meeting with a proclamation declaring April 8 - 14 as National Library Week. Library director Tammi Moe introduced her staff from the Octavia Fellin Public Library and asked they stand to be recognized. Mayor Jackie McKinney read the proclamation before presenting it to Moe. “We encourage all residents to visit the Octavia Fellin Public Library this week and explore what’s new at your library and engage your librarian,” McKinney said. The council moved on to a discussion topic on the Local Election Act, which repeals the current code and enacts new procedures for conducting local elections. Sen. Daniel Ivey-Soto of the N.M. Legislature, District 15, sponsored the bill and said it will become effective on July 1, 2018. “House Bill 98 will establish regular local elections in November of odd-numbered years and it establishes the municipal officers elections in March of even-numbered years,” Ivey-Soto said. There are 106 municipalities in the state and 102.5 of those municipalities hold their elections in March of even-numbered years, Ivey-Soto explained. Gallup holds its elections in March of odd-numbered years, while Albuquerque holds its elections in October of odd-numbered years, and Las Cruces holds its elections in November of odd-numbered years. “Silver City, pursuant to their territorial charter, hosts an annual election in March,” Ivey-Soto said, before sharing copies of the 301-page legislation with the council. The legislation directs all municipalities to host their elections in the March of even numbered years; it repeals the municipal election code; and various other election procedures for special districts are also repealed. The bill stipulates that elections, from now on, would use the election code, utilizing a single process for elections. Ivey-Soto said a similar bill was proposed back in 1917. If Gallup takes no action, municipal officer elections will be moved to March of even-numbered years. The council then shifted focus to its plans for commemorating Memorial Day and Veterans Day. Randal Henry of the Gallup-McKinley Veterans Committee noted how important the celebrations were to the community before the council unanimously passed the motion. The council then turned its attention to a conditional land use permit appeal by John Moore, owner of National RV Properties LLC, also known as USA RV Park on the west side of town. The Gallup Planning and Zoning Commission reviewed this request twice and denied the permit to allow for placement of three manufactured homes on a single parcel of land to replace existing non-conforming trailer houses on the property. Planning and development director Clyde Strain said the request was denied due to policies stated in the Gallup Planning and Zoning Commission. Councilor Fran Palochak said policy must be adhered to. Patrick Miller, park manager, said his family owns the property. They also live there. The family purchased the property 10 years ago, and since that time, they have grown in volume to 70 percent. “We have increased lodgers’ and sales tax to the city by 50 percent over the past three years,” Miller said. He said this was due to safety protocals that were established through onsite management by using the three existing trailers for housing. However, the aging trailers have bad insulation, holes in the floor, subsidence, and other issues. 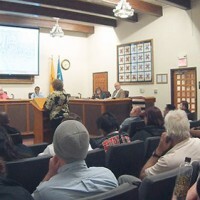 The council debated the item before disapproving the permit by a vote of 5-0.